As a part of my mother's and my Rocky Mountains vacation spent in the breathtakingly scenic State of Colorado one year, we decided to traverse the Continental Divide in two different ways. This time we would see it by taking the Old Fall River Road. 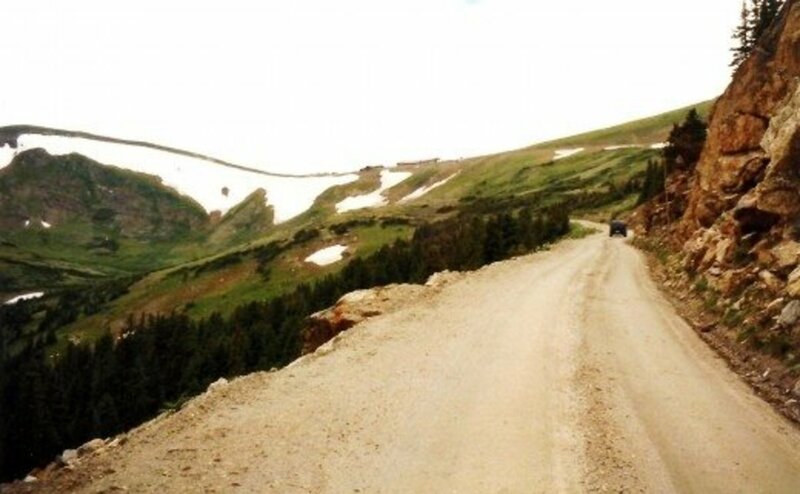 We had already taken the Trail Ridge Road which is one of the highest continuous paved roads in all of the United States and this is probably the most usual way that visitors to this part of the country take in this spectacular scenery. We were about to end our stay in Estes Park and move our location to the other side of the Rockies to Grand Lake, so did not want to repeat the trip already taken. Fortunately there was another way and it consisted of the first motor route to cross the Rocky Mountains built back in the years from 1913 to 1920. Be forewarned. It is not for those who are in a hurry nor for the foolhardy! We were once again in the Rocky Mountain National Park as we were headed towards the Old Fall River Road which would be our route over the mountains this time up to the Alpine Visitor Center. The day was bright and sunny and we caught glimpses of wild animals such as the large deer (or probably elk) that had come out of the woods and into the open pasture such as shown in the picture below. While we stopped the car to get a picture of the elk, a large and inquisitive black and white bird posed for its picture on the car's side mirror. He seemed as curious to look us over as we were him! Seen throughout most of North America aspen trees are always a delight to see. They are particularly beautiful in the fall of the year when their leaves turn a glorious golden yellow color before falling to the ground for the winter. The aspen bark is white and makes a dramatic and artistic counterpoint to the evergreen trees. When seen in groves such as the one we drove through it is a pretty site to behold. Since it was in the summer at the time of our visit, the leaves were still green but the bark sets them apart from most other trees and we made a stop to take a picture. As my mother and I started the upward trek on what would eventually become an old narrow dirt road, we thought that the name given this historic highway was appropriate. 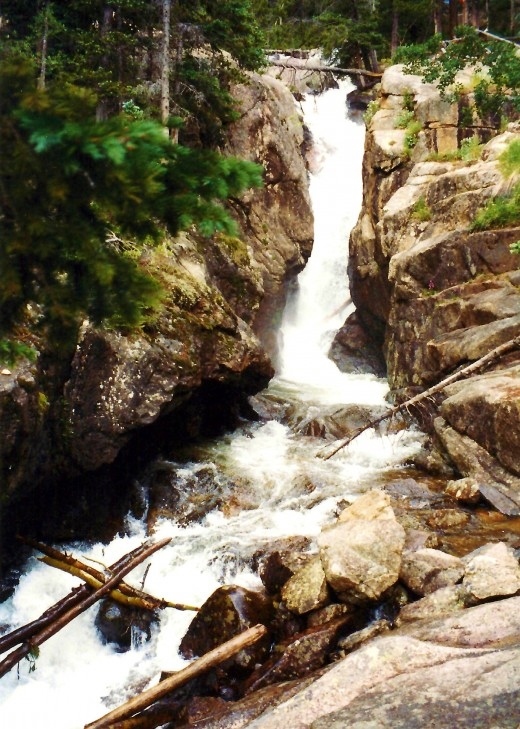 We would see many different waterfalls at different points along the road which closely follows the path of the Fall River. Construction of this early road over the Continental Divide was done slowly using shovels and other hand tools in the beginning. Colorado State prison inmate's labor was utilized when this road building process began in 1913 and was finished seven years later. 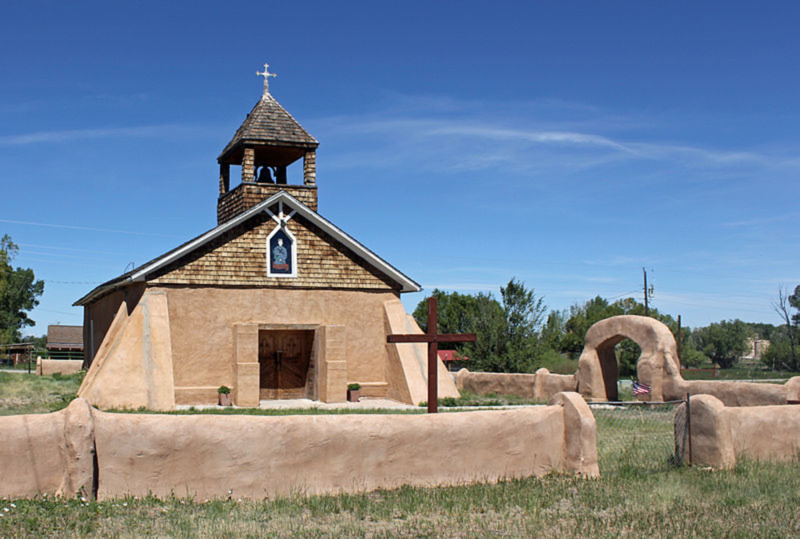 It followed a path called the Dog's Trail utilized by Native Arapaho Indians long before the west was settled. The Indians utilized their dogs to pull sleds made by securing poles together with animal hides to transport things and people over the Rockies in this area. Long before the Native Americans began using this trail, glaciers had sculpted this area over time since the uplift of the Rockies had taken place millions of years prior. 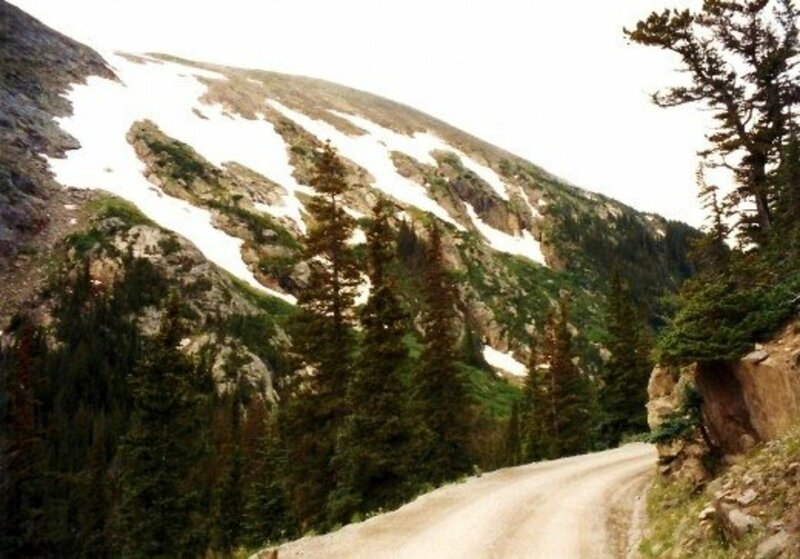 The Fall River Road today appears much as it did upon completion with the exception that it has been made into a one way road ever since the paved Trail Ridge Road was completed in 1932. The bottom third of it is paved but then turns into a graded and narrow dirt road that twists and turns its way up the mountain. One should also follow the precautions of using the lower gears of one's vehicle and not to use air conditioning as this could cause one's car to overheat. No vehicle over 25 feet is allowed due to the narrowness of the road. While the Fall River Road is only 9 miles in length, the hairpin curves and dropoffs as well as elevation changes demand strict attention from the drivers and also mandates a leisurely pace. At every mile there is a post and one can stop to read about what one is viewing as well as some of the geology and history of this area making this a particularly interesting way to traverse the Rockies from east to west. The Old Fall River Road takes one through different ecosystems as one ascends the Rocky Mountains in this part of Colorado. Down at lower elevations we were traveling through what is called the Montane Ecosystem. Starting at around 5,500 feet (1,700 m.) to about 9,500 ft. (2,900 m.) in elevation we passed through meadows, those aspen trees and many different pine trees. It was here that we saw the Chasm Falls. 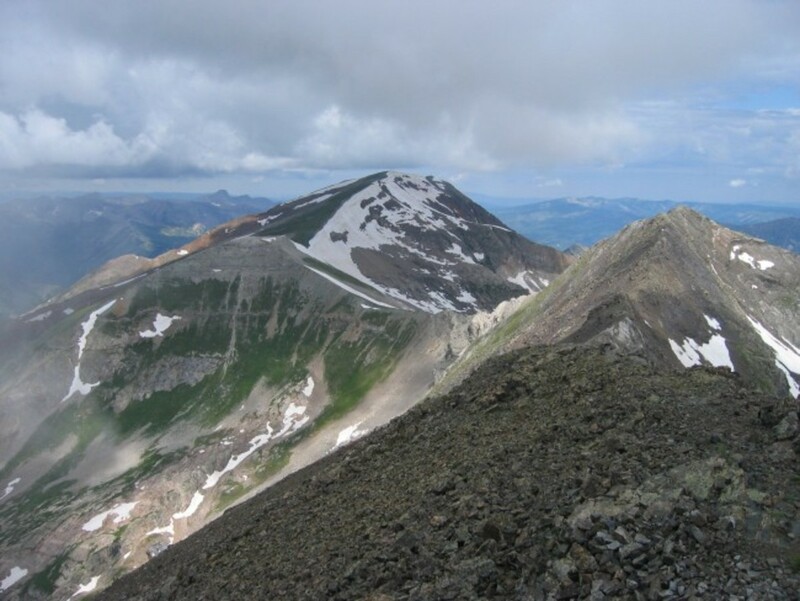 The Sub-alpine Ecosystem goes from around 9,000 ft. (2,750 m.) to about 11,000 to 12,000 ft. (3,350 to 3,650 m.) or at what is called the treeline. There is no exact delineation between ecosystems and depending upon sun exposure or other conditions these can vary a bit. In this sub-alpine ecosystem we saw spruce trees and others that can grow quite large. 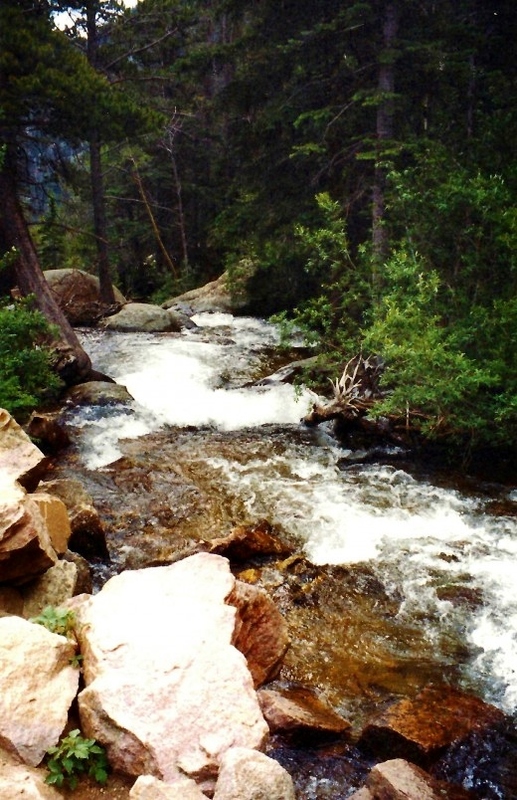 This was also an area where we viewed many different creeks and waterfalls. In some of the meadows elk and deer were spotted. Along some of this dirt road cages of rocks called gabions have been constructed to keep the hillsides intact and to help prevent landslides. As you view these pictures just imagine traveling this road when it was still two way! As one nears the upper limits of the sub-alpine ecosystem the trees become shorter and grow in a twisted and gnarly shape. The word for this is Krummholz which in German means "crooked wood." 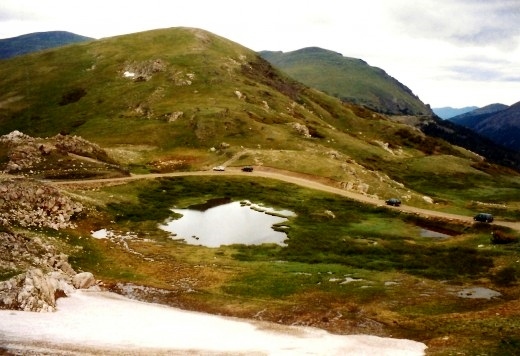 It is the transition between the sub-alpine and alpine ecosystems. 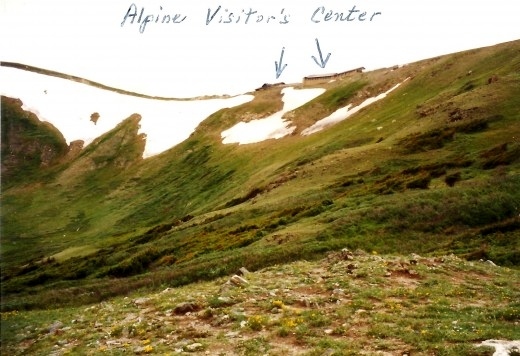 From a distance we could see the Alpine Visitor's Center which we had visited earlier on our Trail Ridge Road drive. 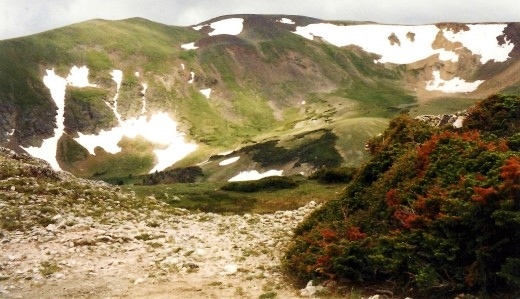 The Alpine Tundra ecosystem is land that lies above any living trees but it does bear life. 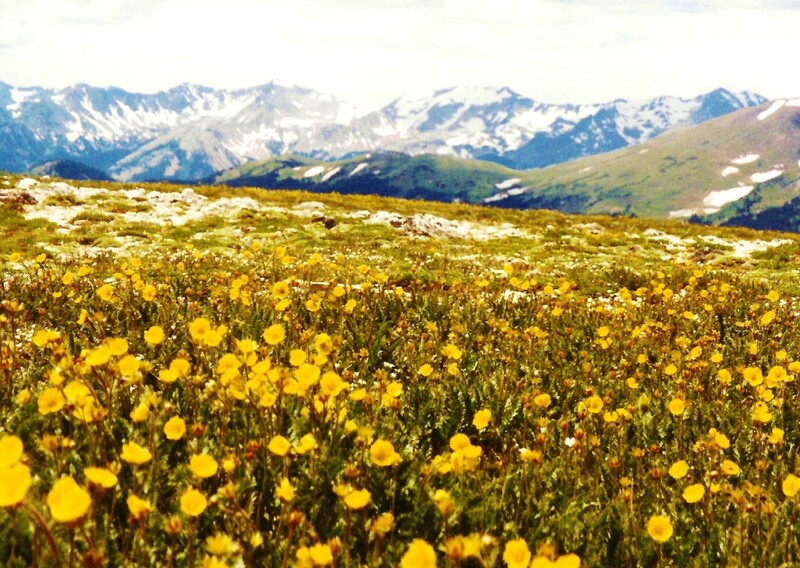 Conditions may be harsh but plant life still exists and the wildflowers in the summer make for a colorful landscape. One should be careful if walking on tundra as it takes years for plants to reestablish themselves if harmed by careless foot steps! If paths are provided, please stay on the paths so that future generations of visitors can enjoy this unique beauty. After reaching the Alpine Visitor's Center where we once again stopped to stretch our legs, get some refreshments and use the restrooms, we traveled 4 miles west back onto the Trail Ridge Road to Milner Pass where the location of the Continental Divide takes place. It is actually 1,000 feet (300 m.) lower than at the Alpine Visitor's Center and it marks the spot where waters flow ultimately either to the Atlantic or Pacific oceans depending upon which side of the Rocky Mountains rain, snow and ice accumulates. Descending the Rockies my mother and I planned our next stop and night's stay at Grand Lake which was another 24 miles away. The air is rarefied at these upper elevations of the Rocky Mountains and the ultra-violet rays of the sun are intense. There are hikes one can take in these areas if one has the time and stamina. During the winter most often these roads (the Old Fall River Road and the Trail Ridge Road) are closed due to snow. So plan visits to this area accordingly. I'll leave you with a few additional pictures as we drove back down the mountain towards Grand lake. Hope you enjoyed these pictures of our Rocky Mountains vacation and getting to travel along the Old Fall River Road and seeing Milner Pass at the Continental Divide. It was certainly a memorable part of our trip and I would suggest exploring this area for yourself if you ever find yourself in that part of Colorado. Have you ever traveled the Old Fall River Road? I have taken the paved Trail Ridge Road however to go over these Rocky Mountains. I would like to do it sometime. That must have been so much fun exploring many different areas in Colorado. It is such a scenic state! We certainly have enjoyed the times we have gotten to spend there. You always have great photos! Estes Park was my first experience in Colorado, and Rocky Mountain National Park was soon afterward. As you know, I lived in CO for 2 years, but on the western slopes. Think I traveled all through the state, and more than once because we had many visitors in our home during that time. Everyone we knew wanted to see Colorado. So nice to have cooler temperatures for the last few days. Hope you are enjoying them down there in Houston too. I took a semi-cross country trip over 30 years ago to Colorado and back to the East Coast. It was a trip of a lifetime, especially the time spent in the Rockies. Would love to return! Hope you get to do it someday. The scenery is fabulous! I have thought that I would like to take a vacation in the mountains most of my life, but it hasn't happened yet. It would be a grand adventure I'm sure, and you help convince me of that. Awesome hub, Peg! The Rocky Mountains are indeed beautiful. So glad to know that you enjoyed these photos. Colorado is having some severe fires this year south of this area. Hope that they will soon be extinguished. Happy to know that you enjoyed these photos and I will look forward to reading your newest hub. Thanks for votes, 5 star rating and the share. HI Peggy W! Just awesome. I am awestruck with the pics and the detailed outlining of beauty of this place. Lovely pictures of the Rocky mountains. Your hub is a sheer delight to read and view the photos. Looking at the Aspen and pine trees reminded me that these 2 trees provide flowers for Bach flower remedies, a hub I just published today. Voted up, beautiful and shared. Rated 5 stars as well. Nice that you have been able to cross the Continental Divide several times and see the great beauty that there is to see while doing so. My mother and I were in awe and so grateful that we had the opportunity to see it from this Fall River Road as well as the other one that gives different looks. Thanks for your comment. Glad you liked these pictures taken in the Rockies on that Fall River Road. I crossed the Continental divide a couple of times in my life. Your pictures brings back happy memories for me; Good article and great pictures. 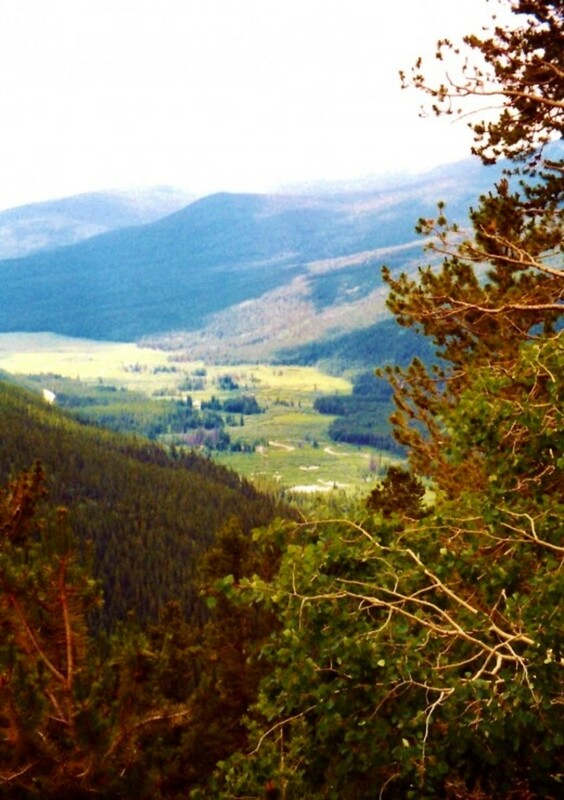 So happy to hear that you enjoyed seeing this part of the Rocky Mountains in Colorado via this hub. I would love to see the Canadian Rockies someday. Have you written any hubs about them? Appreciate your comment. This is a beautiful hub, Peggy! The photos remind me of my visits to the Canadian Rockies. I love the mountain scenery. Thank you for another interesting travel hub that lets me explore the world from my computer. Other than driving through a portion of your State from the Tetons to enter Yellowstone from the west the year of the massive fires when the south entrance was closed, I have never spent much time in Idaho. Would like seeing more of that State someday. We did see great areas of potato farming! Thanks for commenting on this portion of our Rocky Mountains vacation in Colorado. Wow... nice. We are along the Continental Divide too, up here in Idaho. Our mountains aren't as high as the 14k in Colorado, but looking up from a much lower valley floor also have great views. Loved your pictures and especially the movies. Thanks for the effort you put into this. Thank you! Glad that you liked tagging along on this old Fall River Road ride up to and including the Continental Divide. Thanks for your comment. Our home for several days of sightseeing was Estes Park. Haven't written about that specifically yet...but will! So stay tuned! Taking pictures along the old Fall River Road and then seeing the Continental Divide was a real treat on this Rocky Mountains vacation. Glad that you liked this hub and thanks for the comment. Hey Peggy! 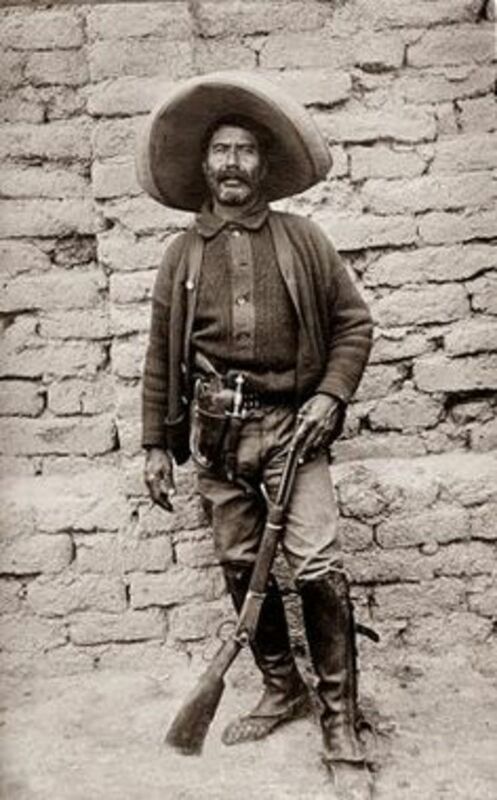 My favorite intrepid traveler! 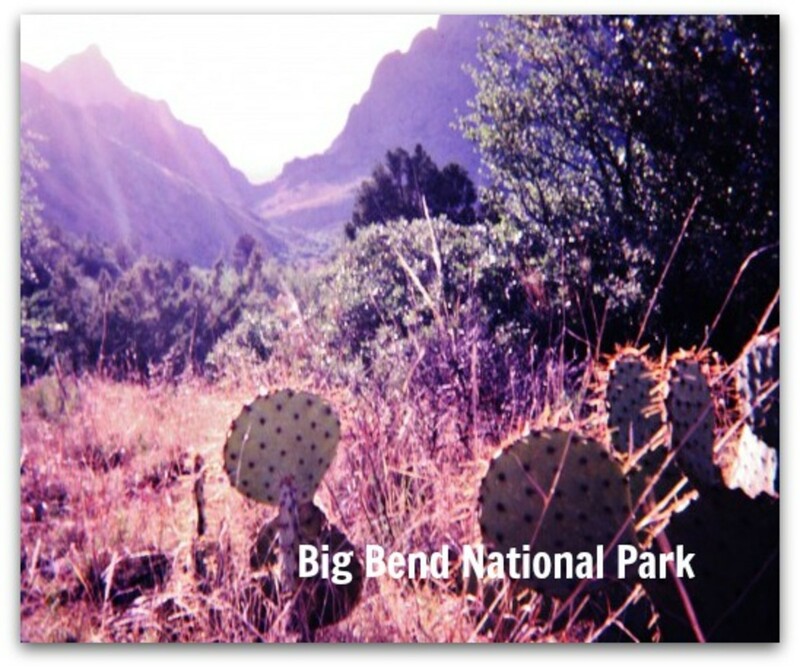 I think you've done a fantastic job on this hub of the Continental Divide! I have a huge fear of heights (or falling from them) so I shall leave the travel here to you. 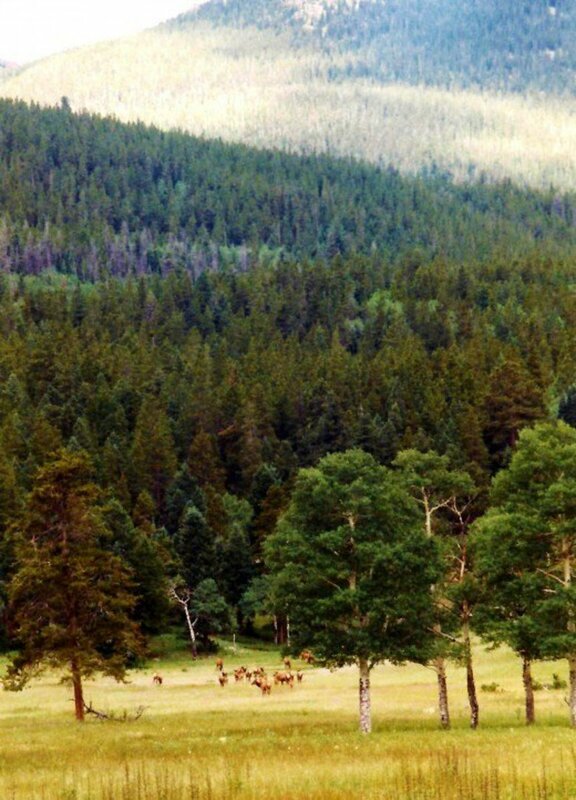 I do have to say, tho, that I was hoping to see photos of Estes Park.. One of My All Time Fave Place Ever To Visit! Maybe another hub.. I shall keep checking. Meanwhile.. carry on! So much for the scenery being authentic in movies! Haha! Probably a feature of budgetary constraints more than anything. * The train depot where Belushi's character says goodbye to Blair's character, but later gets back on the train is the Michigan Central Railroad Niles Depot in Niles, Michigan about 90 miles east of Chicago. It's a large sandstone building built in 1892. The depot appeared in Midnight Run with Robert DeNiro and Only the Lonely with Maureen O'Hara and John Candy. * Glacier National Park, Montana. * Crystal Mountain, Washington which is 40 miles south of the city of Enumclaw. * The final scenes of the movie were filmed in an old train station in Cedar Falls, Washington with an added Amtrak station sign (a movie prop) that read "Victor, WY". Happy to hear that you liked these pictures taken on the Fall River Road and also at the Continental Divide in Colorado. 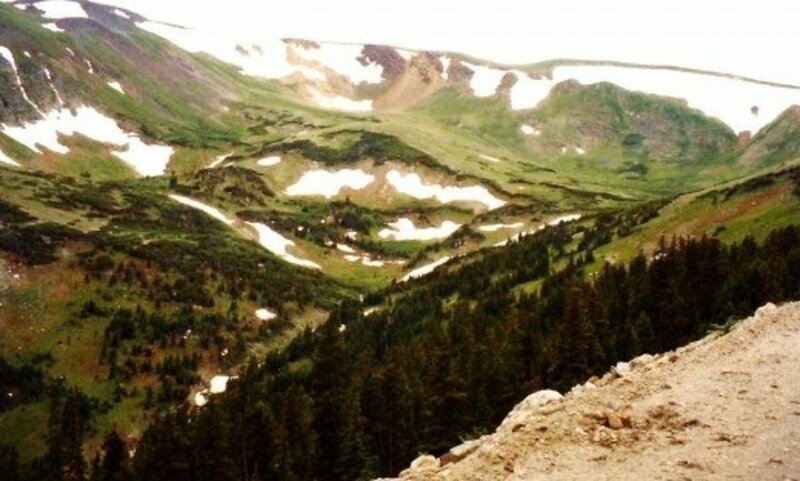 Colorado is definitely beautiful and this hub just shows one day of our Rocky Mountains vacation while there. Thanks for your comment. Beautiful pictures, I love colorade, sounds like a great vacation. I totally agree with you in that Mother Nature makes us feel so small. The Rocky mountains are breathtaking in their majesty and splendor as are many places around our planet Earth. Glad that you enjoyed the pictures and thanks for your comment. You are always so complimentary! I'm so happy that you enjoyed this trip up the old Fall River Road on our Rocky Mountains vacation. Pictures cannot capture all there is to see obviously, but it gives you a taste of what is there. Rather thrilling to be at a spot in the Continental Divide. Thanks again and hope you also are having a wonderful weekend. Bless you! Wow...wow....wow. I love Rocky Mountains vocation by you. Very well written and nice report. You have done a great job, Peggy. I love your presentation. You made this in detail, complete with stunning pictures and video. Rocky Mountains totally beautiful and breathaking. Awesome hub, maybe I can't make like this. My friend, you always entertaining me. I am proud to be your friend and I have a chance to update your hub. Rated up as usual. I'll push all buttons here to appreciate your effort to make this hub. I hope you always healthy...amen. Have a nice weekend! I loved this hub .One of my favourite pastimes is armchair travelling and this one was a treat. Thank you so much for sharing. I am bookmarking and pushing all the buttons on this one. A Rocky Mountains vacation is a bit of paradise. Nicely stated. Glad that you liked the pictures taken on that old Fall River Road and at the Continental Divide. Thanks for your comment. Happy to hear that you enjoyed this portion of our Rocky Mountains vacation. The pictures taken on this Fall River Road are different from those on the Trail Ridge Road...both being scenic and beautiful of course. 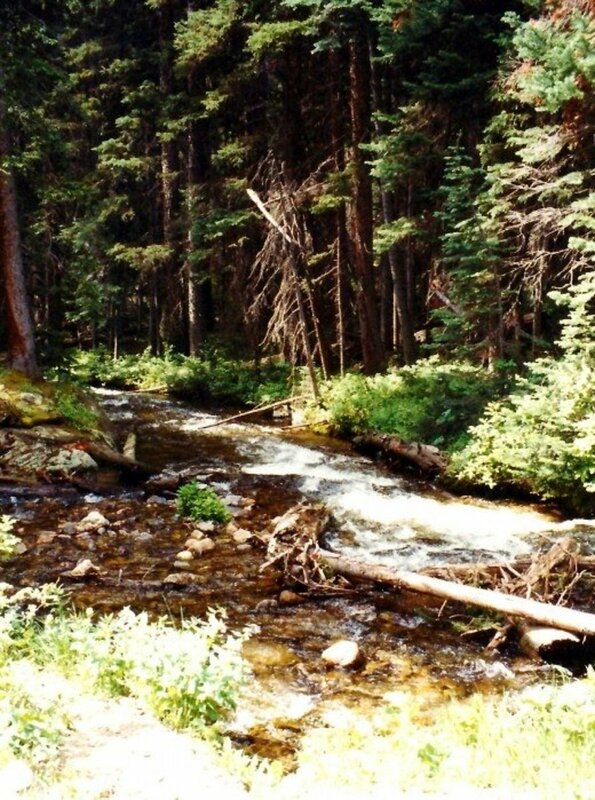 There is so much beauty in Colorado! Thanks for your comment and wishing for you another vacation in that area. The Continental Divide is a beautiful place to see for sure. Nice that you also have memories of visiting there. Thanks for the comment. Thank you for the pleasure of such a wonderful journey. Anther piece of paradise. I think this is a terrific hub and there are not many places in this country any prettier. Your pictures are fabulous and make me want to plan a vacation as it's been many years since I have traveled up in that area. I loved all the videos as well and general layout of your hub. 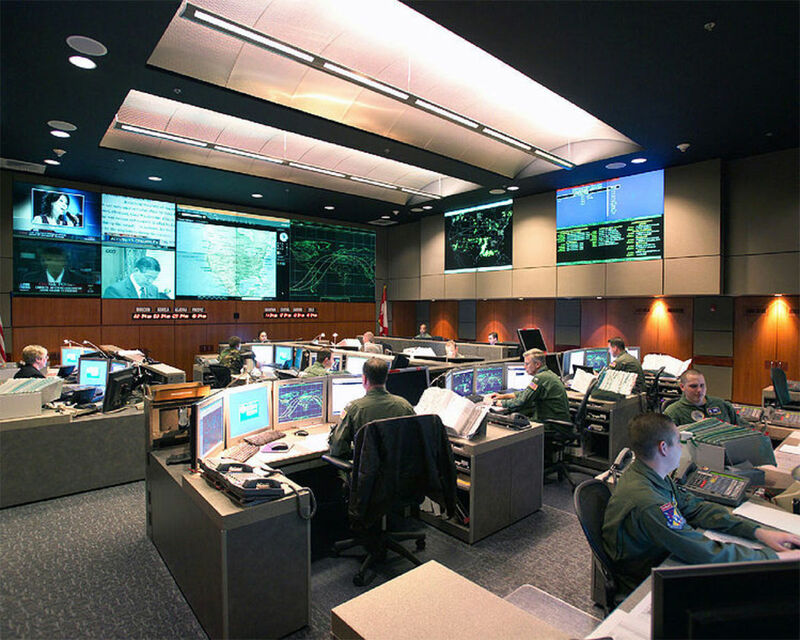 You have created a beautiful hub Peggy - I have seen this area back in 73, The Continental Divide and going over the loveland pass before they made the tunnel. Some beautiful country out that way for sure. Thanks for the wonderful trip. Happy to hear that these pictures transported you to the Rocky Mountains and in particular the Continental Divide and the Fall River Road. Thanks for your comment. Have I told you how much I love your name? Come on over here anytime for coffee time! 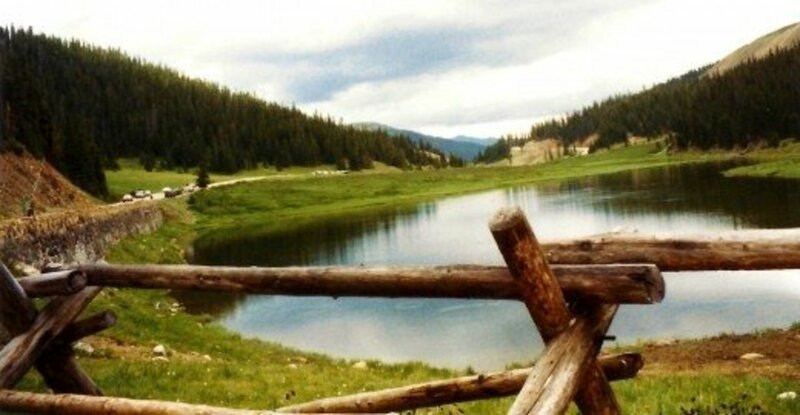 Glad you liked this hub about my mother's and my Rocky Mountains vacation, particularly the part about traveling the Fall River Road to the Continental Divide. As to the movie and Dan Akroyd at the Continental Divide...who knows where the movie was actually made? It may not have even been in Colorado. Chasm Falls seen from the Old Fall River Road was beautiful as were many of the other sights. The road wasn't that bad...as to our bravery...on this Rocky Mountain vacation. Of course, once one embarks upon it...since it is one way...there is no choice as to continue. Ha! Thanks for the appreciative comment. I loved traveling with my mother on not only our Rocky Mountains vacation but also all the other places that we visited together. She was always open to new adventures and when I suggested traveling the Fall River Road over to the Continental Divide...she signed on to that idea wholeheartedly. I really miss her company! Beautiful pictures and great discriptions. Such beautiful pictures. I love the one of Chasm Falls best. You and your mother are brave souls, I don't think I could handle those narrow, steep, roads, even if it meant being able to see those spectacular views in person. I enjoyed reading reading and seeing the stunning pictures. Thank you for sharing your Rockey Mountain vacation experience. I love the scenery and the beautiful pictures of your Rocky Mountains vacation. 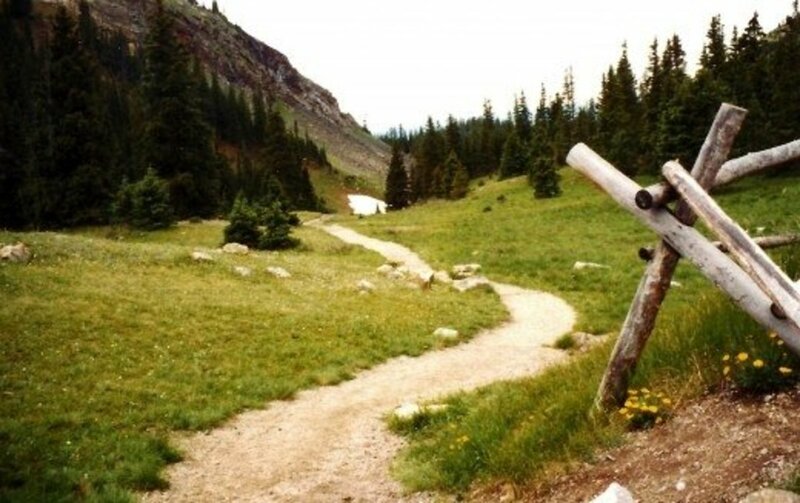 I can only image the peace and serenity your Mother expressed as she traveled along the Old Fall River Road and seeing Milner Pass along the Continental Divide. Another great and informative hub on your Rocky Mountain Vacation,Continental Divide and Fall River Road vacation. 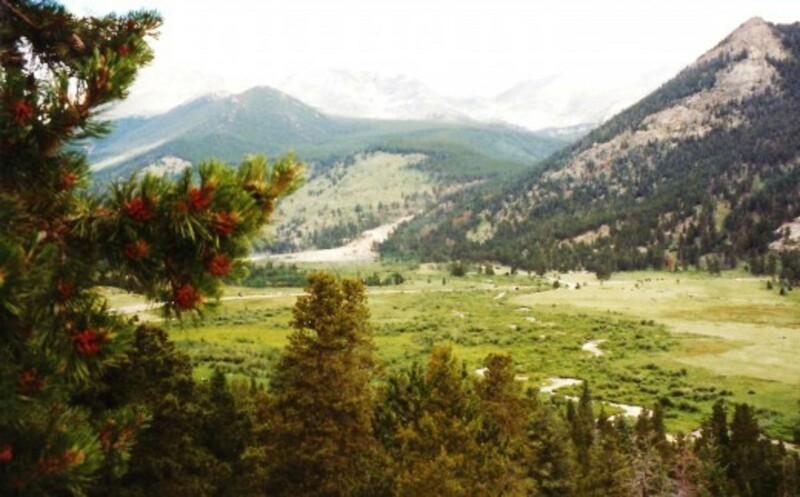 So happy to hear that you enjoyed this journey into the Rocky Mountains vacation hub. My mother and I enjoyed the Fall River Road journey as well as the other paved one up to the heights experienced at the Alpine Visitor Center. Thanks for your comment and also for the wonderful hubs you write about experiences in your country. Very wow Peggy as always. Thank you for this excursion today! God bless you. Hi, what a fantastic journey I have shared with you through this hub. The pictures are stunning as usual and bring the whole thing to life. I have been taught a lot about your country through your educational hubs, long may they continue. The Continental Divide and seeing the Rocky Mountains by way of the Fall River Road was a real treat on our Colorado vacation. The air is a bit thin up there, but as you said, would be a great place for picnics. Thanks for your comment. From your comment you must have spent some time in Colorado if it makes you homesick. 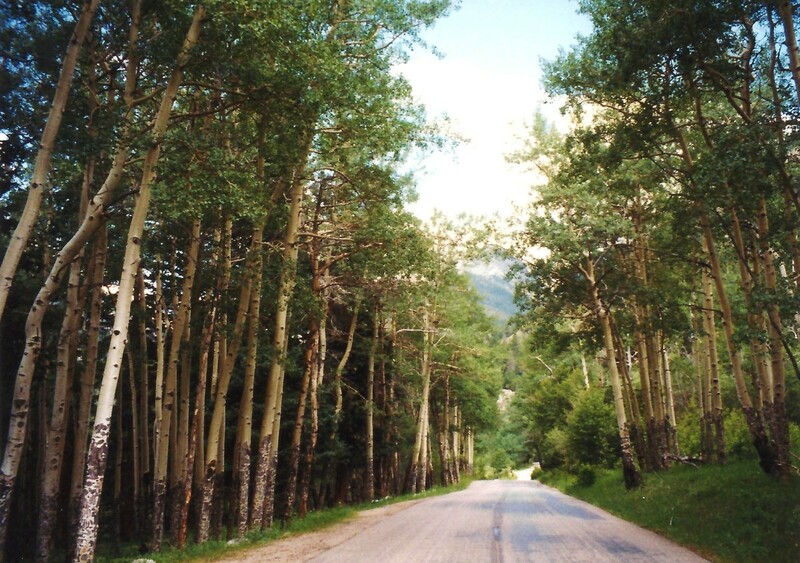 Have you traveled the Rockies by way of the Fall River Road? My mother and I enjoyed both routes to the Alpine Visitor Center and am glad that we got to see it both ways. Thanks for your comment. Nice to know that you liked the pictures of this part of Colorado. Thanks for the comment. Glad that this hub about my mother's and my Rocky Mountains vacation could bring back some memories for you. 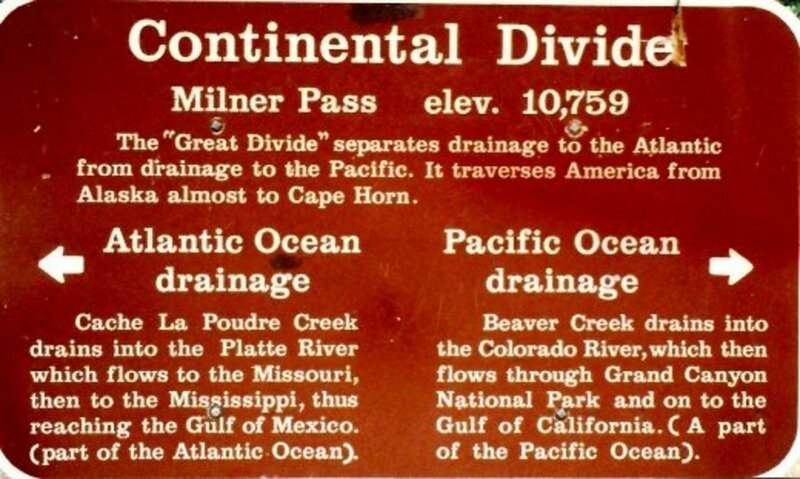 Did you travel the Old Fall River Road and see the Continental Divide at Milners Pass? Thanks for the first comment. A great place for a picnic. 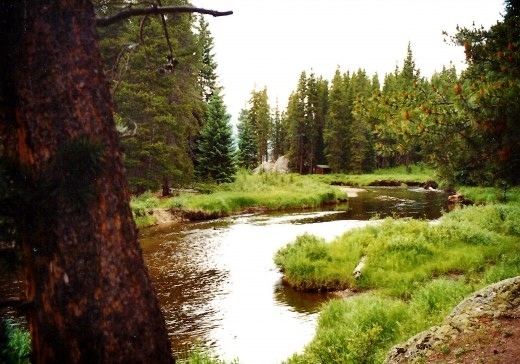 I can see from the pictures Old river and Continental divide are so beautiful and serene. nice! i love colorado! makes me homesick! Beautiful pictures supported by a well written narrative. Thank you for sharing this memory. I have been through some of this area but a long time ago. Your pictures,as usual, are very good.